MetalRockNews: Mötley Crüe's Nikki Sixx: "My flamethrower bass weighs almost a hundred pounds"
Mötley Crüe's Nikki Sixx: "My flamethrower bass weighs almost a hundred pounds"
Mötley Crüe bassist Nikki Sixx and singer Vince Neil were recently interviewed by TheNational.ae about band's "The Final Tour", you can read some excertps below. About the Mötley Crüe stage show, Sixx said: "It always starts with the songs, to be honest with you. You know, the lights and whatever effects we have, it all comes from the rhythm of the songs, or maybe there's a story with the lyrics, or maybe there's a color associated with a song, like 'Dr. Feelgood'. A lot of times we're working on that and the color green comes up, because of the album cover, green with the medical symbol on it. And then we always try to push ourselves as far as set designs and... And we use technology. We're always trying to find out what is brand new. A lot of the stuff that we've developed with pyrotechnics has never been used before. And a lot of times, after we use pyrotechnics, they'll become available, and you'll see other bands using them, and they try to use 'em in their own way and stuff. And then we never go back to that same technology; we try to develop something further. The stuff that we have in Europe when we play outdoors, the flameheads that we have shoot about ninety feet. And when we were playing in Sweden, the wind was blowing, and they were out at the front of house and on the side of stage, and the wind was blowing, and it was literally, like, fire over the whole audience. Definitely probably not legal, but... you know." Added Neil: "This year we're bringing over the biggest show to Europe that we've ever done. We're bringing over Tommy's... his drum thing, which is a two-hundred-foot-long roller coaster... I mean, things like that that people will go, they've never seen anything like that before. 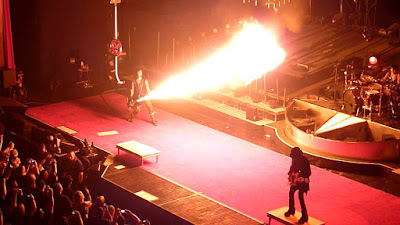 And then, like Nikki was saying, with the pyrotechnics, the newest technology of pyro, the lighting, the whole show..."
Sixx also talked about his flamethrower bass: "It's like holding on to a dragon, to be honest with you, a fire-breathing dragon. It's painfully violent, is the only way I can describe it. When Vince sings the last 'Shout at the devil,' and I do the last shot, I walk over and I want that thing out of my hands. 'Cause it weighs almost a hundred pounds, and it's so hot that... When we start the song, I'll be soaking wet, and at the end of the song, my hair is dry. It's amazing."